The Suzuki DF2.5 portable outboard is the smallest Suzuki 4-stroke to date. 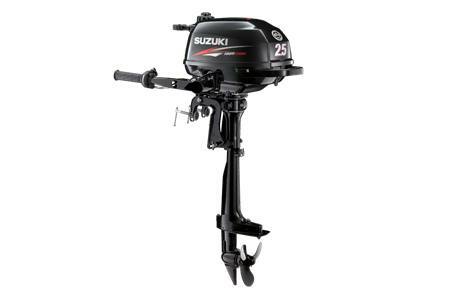 Weighing just 30 pounds, the DF2.5 is the lightest Suzuki 4-stroke motor ever built. Suzuki is also proud to note that the DF2.5 meets the rigorous EPA 2010 and CARB 3-Star Ultra Low emissions standards. A 2.5 HP single cylinder OHV 4-stroke engine, with 4.15 cu. in. displacement, generates plenty of power for small tenders and inflatables. It features easy-to-pull recoil starting with Suzuki Pointless Electronic Ignition. No battery is required for this remarkably simple and reliable system.